The location of Kefalos Beach Tourist Village combines peaceful seclusion with easy access to the centre of Kato Paphos with all its amenities and places of interest. Kefalos Beach Tourist Village has its own unique character as its architectural design is that of a traditional village. The tourist Village was conceived from a deep rooted desire to fulfil the ancient tradition of genuine hospitality. A jewel in the crown of Cyprus Hotels. Beautifully located on a scenic setting overlooking the azure Mediterranean and in total sympathy with its surroundings it blends everything you would expect from a purpose built resort with the ambience and charm of a village. The Kefalos Beach Tourist Village has an excellent range of facilities for all of the family and stands out because of its purpose built accommodation and services for disabled people and its locations for wedding ceremonies and receptions. The Mosaics, Lighthouse, Odeon, Byzantine Ruins, Paphos Medieval Castle, harbour area, local bars and restaurants, are easily accessible via the newly constructed beach front promenade. Its ideal location combines peaceful seclusion with easy access to the centre of Kato Paphos along with all its attractions. The facilities in the Paphos holiday apartments and onsite are excellent and provide all the requirements for unforgettable Holidays in Cyprus. The indoor public areas include a lounge and reception area, the Korevos Conference Room, the Regina Room (multiple use room), a Cards and Library room, ample parking space is provided, various shops that include a souvenir-fruit and mini market, launderette and chapel etc..! 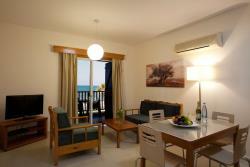 Apartments at Kefalos Beach offer a wonderful experience of comfort and peacefulness. The spacious verandas with fresh Mediterranean air make you feel at home. 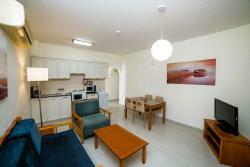 Each apartment has a maximum capacity for 3 or 4 persons and is tactfully decorated in traditional Cypriot colours. 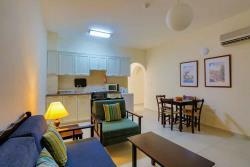 It consists of 121 one bedroom apartments with a maximum capacity of 4 persons and 123 studio apartments with a maximum capacity of 3 persons. 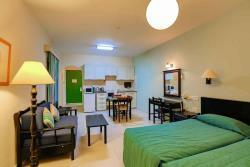 The Kefalos Beach Tourist Village provides superior rooms in the studio apartments and one bedroom apartments range. 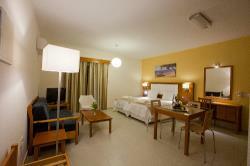 These include a higher standard of facilities and furnishings which build on the quality level of our other hotel rooms. 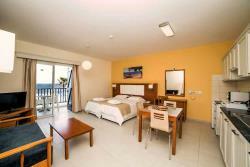 All superior rooms have a side sea view or full sea view. Start your day at Arodafnousa Restaurant which offers an excellent breakfast buffet to suit all tastes. 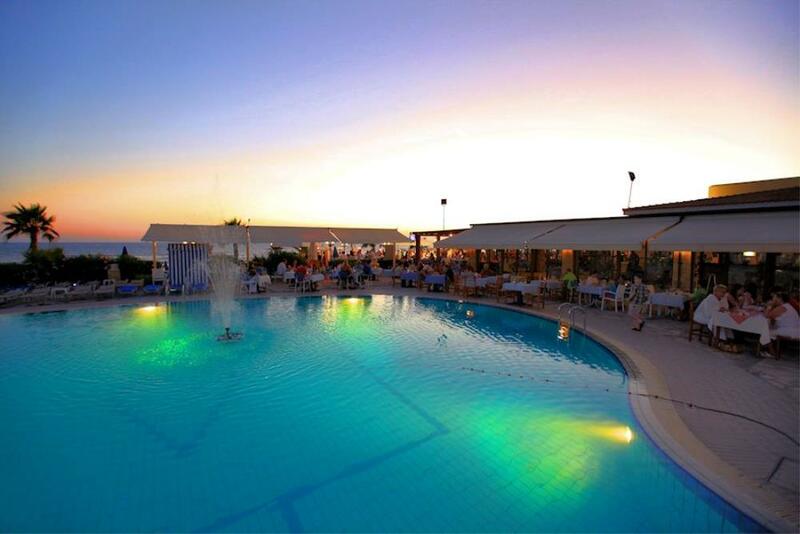 Enjoy a variety of drinks and snacks at Romios tavern with views of the Mediterranean sea and Kefalos' pool. Experience real Cypriot and international cuisine at dinner time at Arodafnoousa Restaurant and relax after your dinner with a drink at the Akritas indoor full air-conditioned bar, or at the outdoor bar of Romios while watching the animation programme. 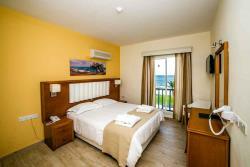 The All inclusive package is valid from 10:00 a.m until 00:00 hrs. After midnight all drinks will be charged at the prices as listed on the beverage menus. At the hotel every guest can find Children's club room, an indoor heated swimming pool with sauna, Jacuzzi, the Kefalos Fitness and Gym club, games room, l offices, a large swimming pool with a walkover bridge and attractive surroundings with a sun terrace, a children's pool, a tennis court, mini golf, a volley ball court and beach volley court, a children's play area. Ideally located in Kato Paphos, halfway between the Lighthouse and the Tombs of the Kings stretching alongside the picturesque beach promenade starting at the Paphos Fort and continuing up to the Mosaics through the Archaeological prototype Unesco Park. The location of Kefalos Beach combines peaceful seclusion with easy access to the centre of Kato Paphos with all its amenities and places of interest. Paphos has its own international airport. The airport receives flights from most cities in Europe as well as some Middle Eastern and North African destinations. Paphos (or Pafos) is one of the most beautiful and ancient towns of Cyprus. 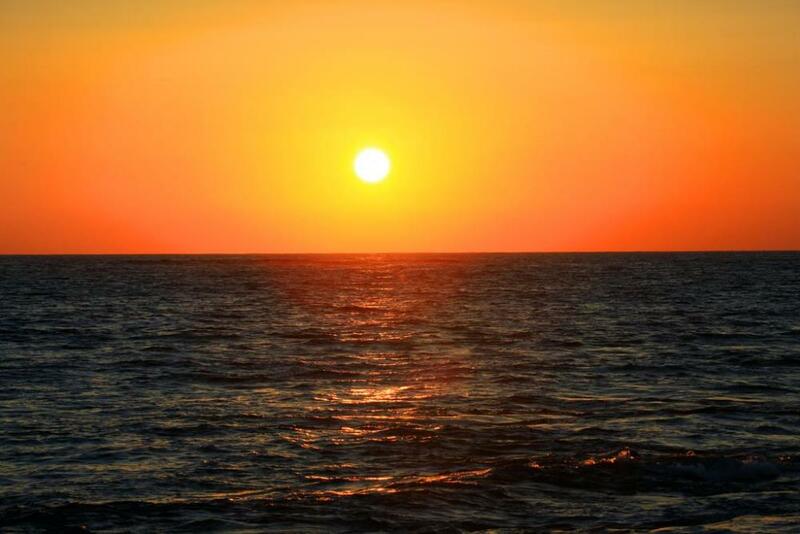 Wherever one treads in Paphos he comes across its glorious history which dates back thousands of years, when the cult of goddess Aphrodite who emerged from its seas, flourished in this beautiful part of the world attracting many visitors from the island and abroad. Today Paphos is a small harbour town, but in Hellenistic and Roman times it was the capital of Cyprus. Still under the spell of her Beauty-Goddess, the area retaining her magic, has remained impact by time. Paphos seduces its visitor with its majestic landscape, lovely coastline, historical treasures and delightful villages where tradition is still a way of life. The legacy from its remarkable history adds up to nothing less than an open museum, so much so that UNESCO simply added the whole town its world Cultural Heritage List. Among the treasures unearthed, are the remarkable mosaics in the Houses of Dionyssos, Theseus and Aion, beautifully preserved after 16 centuries under the soil. Then there are the mysterious vaults and caves, the Tombs of the Kings, the ancient Odeon Theatre and other places of interest including the various Museums. Upon check-in you will receive an all-inclusive wristband that entitles you to take full advantage of F&B facilities. Please be advised to kindly wear your wristband at all times, otherwise the staff will not be authorized to serve you. Wristbands: for in-house children and teenagers under 18 years old. In accordance to the Cyprus law and with strict instructions, the staff will not serve alcoholic beverages to any guests under 18 years old. The All Inclusive package has been designed to further increase the quality and value added experience of your holiday, offering you a variety of delicious pleasures of food and beverages. Throughout each day, meals, snacks, and drinks are available to you to thoroughly enjoy in the hotel. Late arrivals will receive a welcome pack with cold sandwiches and bottle of water in their room fridge on the night of arrival. Visit Arodaphnousa restaurant for breakfast and dinner, and enjoy the ambience of traditional designed restaurant. Visit Romios Tavern for lunch and snacksand enjoy your meals while facing a spectacular view of the Mediterranean Sea. A well trained kitchen and restaurant staff are available at your disposal for any requests. The chef offers you a rotating variety of themed dinner buffets to ensure that you try something different every day! Cuisine: Different Theme Night Buffet every evening for your enjoyment. Dress Code: Smart casual wearing in all meals. Please always wear shoes or slippers during meals and always wear a t-shirt. Notes: Please note that the chef will cater for special diets and requirements upon request. Operating Hours: Open daily from 09:00 - 01:00 offering a wide range of beverages. 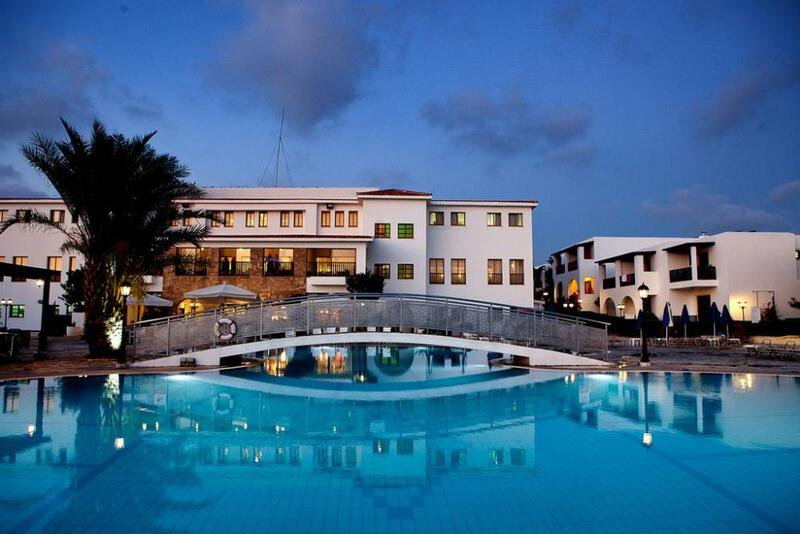 The All Inclusive package is valid from 10:00 hrs until 00:00 hrs. After midnight all drinks will be charged with the prices listed in the bar menu. Beverage Menu: Local Draught Beer, Soft Drinks, House Branded Spirits (rum, vodka, gin, tequila, and whiskey), Local Brandy, Local Aperitifs, House Wine, Local Liqueurs, Cocktails as on Bar List, Filtered Water, Tea, Coffee, and Hot Chocolate. Operating Hours: Open daily from 16:30 - 01:00 offering a wide range of beverages. All inclusive last order is 00:00. After midnight all drinks will be charged with the prices listed in the bar menu. Beverage Menu: Same as Pool Bar Beverage Menu. Local draught beers, local wines (white, red, rose) by the glass, soft drinks, fruit juices(not freshly squeezed), squashes and house branded spirits & mixers. Notes: If you wish to order any drinks, which are not included in the all inclusive package, e.g. imported drinks, normal menu prices will apply. Day and Night Entertainment Programs: Please refer to the entertainment notice board for weekly program. 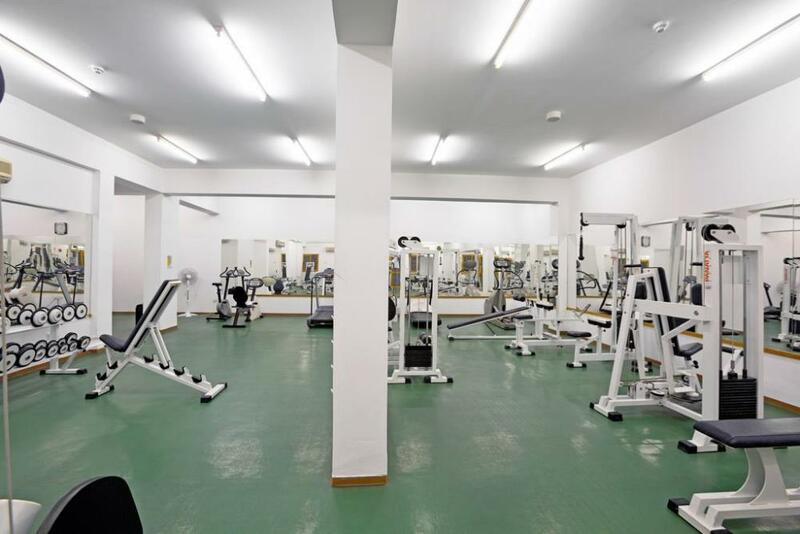 Freeuse of facilities such as Wifi in all public areas, Tennis court, Gym, Kids Club and Playground.